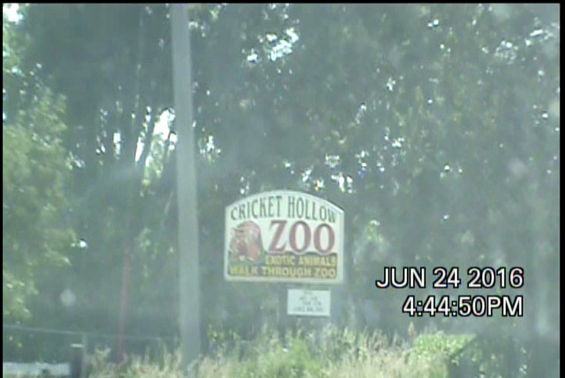 The endangered tigers and lemurs ordered removed from Cricket Hollow Zoo will be sent to new facilities by July 17, but both locations face some of the same shortcomings cited by animal rights advocates in their federal lawsuit against the Manchester roadside zoo. Chief Magistrate Judge Jon Stuart Scoles ordered the endangered animals be removed from Cricket Hollow Zoo while the case is on appeal with the tigers going to the Exotic Feline Rescue Center near Centerpoint, Indiana, and the lemurs relocated to the Special Memories Zoo, near Greenfield, Wisconsin. The endangered tigers and lemurs held at the troubled Cricket Hollow Zoo should be in a new home yet this summer. U.S. Chief Magistrate Judge Jon Stuart Scoles April 29 denied the zoo's petition to stay his court order requiring removal of the animals from the rural Manchester, Iowa roadside zoo. The owners of the troubled Cricket Hollow Zoo have appealed the federal court ruling issued Feb. 11 which ordered removal of the zoo's lemurs and tigers because of inadequate veterinary care and sanitation for the endangered animals. Owners Tom and Pamela Sellner, of Manchester, filed the notice of appeal with the U.S. 8th Circuit Court of Appeals in St. Louis March 9. The appeal seeks to reverse the lower court decision, halt the removal of endangered animals from the zoo and lift the court's order prohibiting the Sellners from adding endangered animals to their roadside zoo. Cricket Hollow Zoo has been ordered to transfer its lemurs and tigers to a licensed U.S. Department of Agricultural facility under a federal district court ruling issued Thursday (2/11). The judge ruled that the endangered animals at the troubled roadside zoo were harmed by the failure of its owners to provide adequate veterinary care and sanitation. Tigers, lions, wolves and African wild cats at Cricket Hollow Zoo near Manchester "are suffering inhumane living conditions that result from owners, zookeepers and veterinarians who lack the expertise, the experience and the resources to care for captive wildlife," a California vet with 21 years of experience in caring for such animals says.